1. We lost two of our matches today due to physical problems/changes on the robot and just because we were against a better alliance team. That’s okay though, because we have plenty of matches to go tomorrow to make up for it! 2. We didn’t stay for opening ceremonies tonight…just due to fatigue after a 12 hour day the majority of the team wanted to come back to the hotel and get some sleep. We will for sure be going to closing ceremonies so I will take pictures there! 3. The fatigue is setting in. I think everyone is tired because we aren’t used to sleeping somewhere new for this long, but that’s okay! After about an hour after waking up we are all awake! 1. Our gracious professionalism today was on point! We were more talkative and willing to say “Hey” to the community and the people working/competing there! The whole team was pretty awake and alert today, so it was nice to teach them our motivational songs and how to get the public pumped up! We got a lot of “You guys just made my day betters” or “This made my day” from people! 2. We had two groups of judges come and talk to us today! The first group were only two and one of them was our actually judge yesterday in judging. They had questions about our robot during the game and the second set was a larger number..if I recall correctly it was 4-6. They were interested in our autonomous and how it worked. 3. We got to go to the dome today to see FRC and FLL! Their games this year are amazing! The pits were in a giant warehouse-essue area, with both FRC and FLL practice fields. Seeing the FRC teams’ robots made ours seem really small, and the FLL practice fields could be taken up by two of our robots. Going to see the other leagues let us see the other sides of FIRST. But going into the main hall where the FRC had their matches… It was intense. And extremely fast; they had the teams in and out really quickly getting the arena setup with amazing speed! There we a lot of volunteer’s everywhere all of the time more than welcome to help you. The FRC game this year seems to really intense and the FLL kids as always: are super cute and really amazing for being so young and making it into the top 3% of teams around the world. 4. We get to go to the City Museum tomorrow evening! I am really excited for that because I have been there before…a couple of times. Basically what it is, is a giant warehouse FULL of toys. You can touch anything and there are walls, literal walls, made out of bread pans or stamps or old glass soda bottles. There is a 7 story slide, a giant organ, the worlds largest pencil and a food shop! I am SOOOO excited to take the team there and get our heads out of the game for awhile. 5. I got to meet an inventor today and talk to a lot of colleges who are interested in engineers, and people wanting to go into business. 7. I got my makeup done by: Jane! Google “Jane Makeup” The woman is amazing! On another side note: I forget to mention that Gillian and I went to a team social for a little bit yesterday. The founding fathers of the FTC were there and the actual game designers of this years FTC Cascade Effect were there answering any questions that we had. I was the first person to go up and I asked them: “What was that “ah-ha” moment when you both equally said: We HAVE to make this our game?” They both looked at each other for about 30 seconds and then sighed. They looked old in that moment, but it was okay because I would have let them take all the time they needed. Then they answered: “Long nights.” It was a joke but they continued with: “Last year when we announced Block Party we had two games developing at once. We chose to present Block Party to you last year because it seemed like a lot of fun. So when this year rolled around, we wanted to give all of you something harder because of how smart you are. We were visiting a company this year and learning how they manufacture their product and for some reason, that is when we said yes. After a lot of game rules a set up and a show off, it went through successfully and now all of you FTC teams are in the top 3% of all of the FTC….which is saying a lot because the FTC is the largest growing program at FIRST.” I was completely amazed. Just two guys created this idea…it was a spark, which turned to a flame, and ignited the fire. I read with great interest the other day Jeff Utecht’s post regarding his declining Technorati authority. Although I agree with others that Technorati has some deficiencies as a blogging metric, it still can be a useful tool to help monitor conversations and online presence. the natural competition for comments and links that results from an ever-increasing number of high-quality edublogs. Jeff hypothesizes that another factor may be Twitter. As many of us move our conversations that direction, fewer posts and/or comments are occurring in the edublogosphere. I’m an infrequent tweeter, so while Twitter may explain The Thinking Stick’s decline, it doesn’t really explain my own. In Jeff’s comments section, Sue Waters also notes that the decreases in authority may be due to the recent changes in Technorati’s indexing methodology. 1. 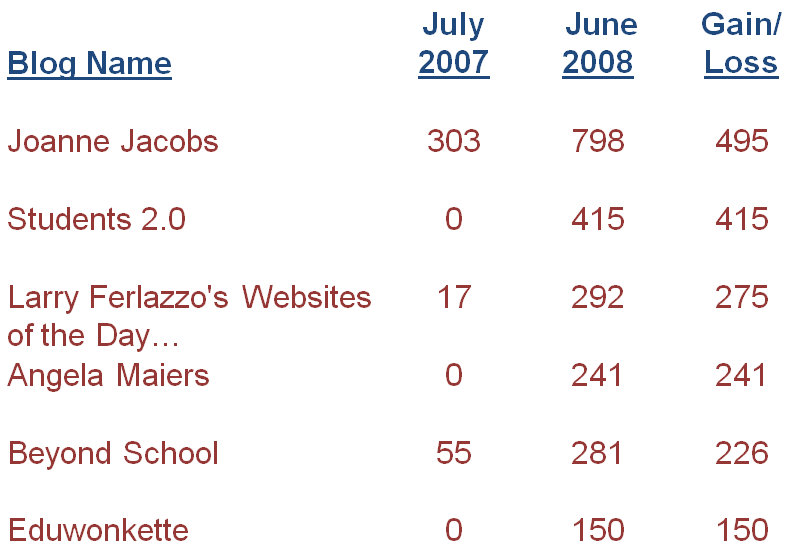 Nearly all of the top edublogs (as measured by Technorati authority) saw a decline in their authority since June. 2. Using today’s numbers, the list would look like this instead. 3. Here’s the list ordered by gain/loss in authority rather than overall authority. Only six blogs saw an increase in authority since June. 4. 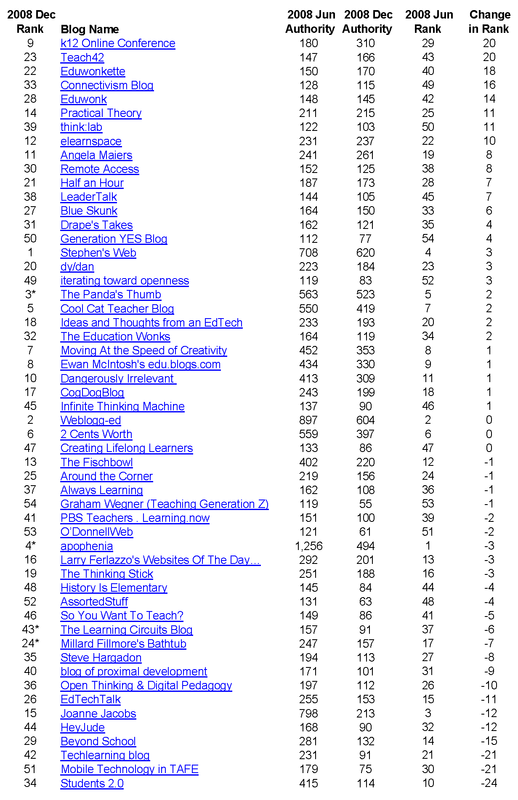 Here’s the list ordered by change in overall rank (again, within just this list and not the overall edublogosphere). 5. Finally, here’s a graphic that shows each blog’s change in rank since June (ordered by overall authority). Red is a decline; green is an increase; blue is no change. Like Jeff (and unlike many of you! ), I find much of this fascinating. For example, think:lab’s rank went up 11 spots despite the fact that Christian Long quit blogging there in August. That was a neat trick, Christian (and, BTW, I hope your new gig’s working out well for you)! The top part of the list was pretty stable. Most of the movement occurred outside of the top 10 or so positions. Students 2.0 had the biggest drop in the rankings. Was it so high before because we liked the content better compared to now? Or were we simply giddy with the idea behind the blog but now have realized that the content is not as relevant to many of us? Is the TechLearning blog’s decline due in part to its general inability to accept comments? The K12 Online Conference blog rankings likely are cyclical. Up in the fall just before and after the conference. Down six months later as all of the traffic regarding the conference drops off Technorati’s radar. Time will prove if I’m right or not on this one! Kudos to the bloggers (Angela Maiers, Jennifer Jennings, Steve Dembo, George Siemens, and Chris Lehmann) who actually increased their Technorati authority in the face of steep overall declines. Wow. Any of you have thoughts on this fairly esoteric stuff? I’m both pleased and embarrassed to announce that the results from my second annual Education Blogosphere Survey are now available. Pleased to finally be done and that there were 419 participants. Embarrassed that the gestation almost exceeded that of a human newborn. Thank you, Dan Meyer, for politely staying on my case about this. I hope the results are worth the wait. Note that I didn’t do anything with the open-response items. Feel free to dig through one of the Excel files and do your own analysis (please let me know if you do!). There are lots of useful resources in the additional information in the database. As always, these materials are available under a Creative Commons license. Let the conversation begin! Below is my latest attempt. I made a few changes from last time, which I describe after the table. Authority and rank are from Technorati as of June 2. Clicking on each blog name will take you to its Technorati page. 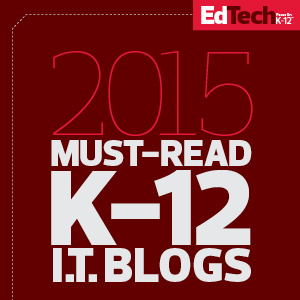 This time I only included blogs that predominantly post about P-12 education. No higher education blogs. No blogs that are mostly about training, software tools, or other topics with an occasional P-12–related post. No education news channels that happen to have an RSS feed. Just ‘pure’ P-12 blogs. I was on the fence about four blogs on the chart; those are marked with an asterisk. I included blogs 51 to 54 in case you think those four should not have been included. I gave up monitoring the several thousand blogs on my previous list. There were just too many to catalog and also too many newcomers. There are over 100,000 edublogs! I feel fairly confident about the accuracy of this list. I considered listing the top 100 but was not as confident about blogs 70 to 100 because I kept finding new ones in that range. If I missed you, I’m sorry. Please let me know for next time. If you don’t like or disagree with my selection criteria, feel free to make your own list. It would be interesting to compare yours with this one. The very notion of what constitutes a ‘top’ edublog is very personal and individual (see, e.g., posts by Stephen Downes and Peter Rock as well as the numerous comments regarding my last two attempts). Also, Technorati has a number of issues, but no one has yet suggested a more viable alternative. There are many, many great blogs not on this list. While a number of people are finding value in the blogs in this table, some excellent writing is occurring on blogs with lower authority. Read and write blogs for your own reasons rather than worrying about the numbers. 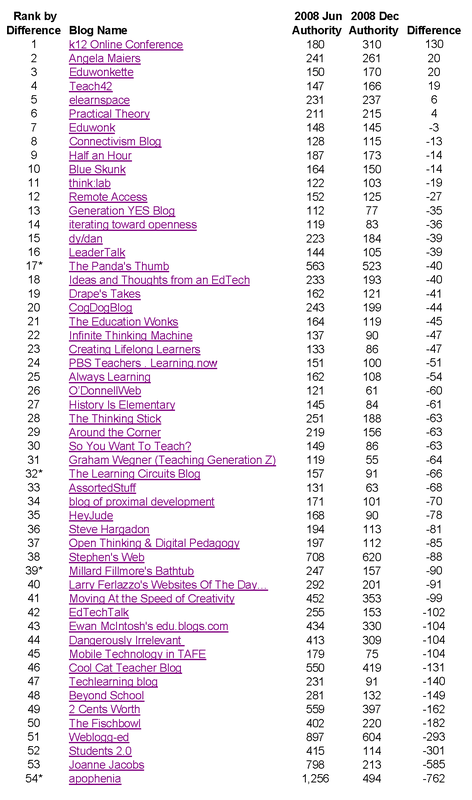 Only 19 of the top 50 blogs in the chart above are on Alltop Education. 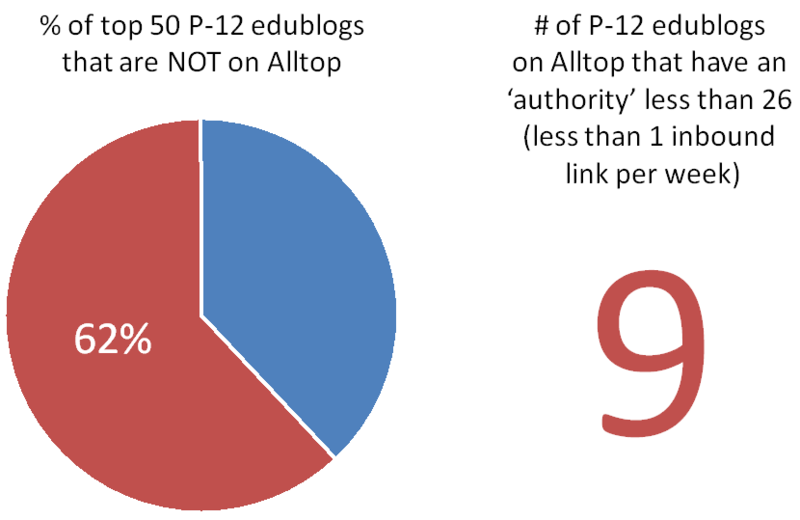 Interestingly, I also discovered that at least 9 of the blogs on Alltop Education have an authority of less than 26, meaning that they have less than one inbound link per week. Take heart, bloggers who want more readers / links! As the chart below shows, a number of the blogs on this list had large gains in authority over the past 11 months. 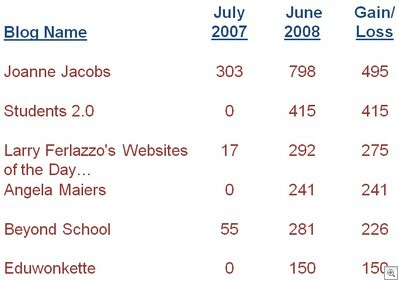 Some of the top blogs (including Students 2.0, Angela Maiers, and Eduwonkette) didn’t even exist a year ago. As always, please let me know if you have any thoughts or reactions regarding this post. I am deeply honored that so many of you choose to read my blogs, appreciate any and all feedback, and look forward to the conversation! Some hubs are connected to thousands of other hubs and nodes; we might call these superhubs (e.g., A-D). Other hubs (e.g., E-H) are connected to less than a dozen nodes. The key here is that many nodes never would come into contact each other except for the hubs. For example, edublogger 1 only finds out about edublogger 2 because edublogger A highlighted and linked to something edublogger B wrote about edublogger 2’s post. The hubs and superhubs are the essential connectors, the glue that holds the network together. For example, if edublogger 2 quits blogging, the only one that loses access to that voice is edublogger B. If edublogger C stops blogging, however, the rest of the network not only loses access to that person’s voice, it also loses access to the voices of those edubloggers to which only C linked. If edublogger A quits blogging, the network loses access to edubloggers E and F as well as all of the individual edubloggers to which only they were connected (at least until those nodes get reconnected to other hubs). The process is all very fluid, shifting and changing with each hyperlink. There are advantages to being first, but over time quality wins out. 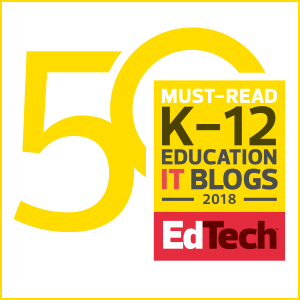 One of the reasons that edubloggers like Will Richardson and David Warlick are superhubs is because they were some of the first ones in the education blogosphere. They had first-mover advantage and have had time to build up their audience compared to the new edublogger who started yesterday. That said, over time their advantage begins to diminish as others enter the network. If Will and David’s posts didn’t continue to be of high quality, people would link to other bloggers instead and Will and David’s audiences would dwindle. Hubs and superhubs must have ‘sticky’ content in order to retain their roles in the network. It’s a testimony to many of the top edubloggers that they’ve been able to be consistently good, as defined by their audiences, for a long period of time. If you are interested in making change, the hubs and superhubs have important roles to play. Why? Because they’re the ones with the ability to reach many. They’re also the ones with the ability to bring important ideas generated out on the fringes of the network into the mainstream center of the network. It’s not just an issue of ‘popularity.’ Because we voluntarily visit / subscribe to blogs, content wins out over superficiality in the end. High-ranking blogs are there because others value their voices. You may not think an individual blogger is interesting, but others often do in large numbers. So Terry Freedman says, “Quality not quantity.” And Vicki Davis says “meaningful” is more important than “popular.” But as item 3 above notes, these supposed dichotomies actually are conflated. I see knowledge and identification of the hubs and superhubs as important for facilitating change. Sheryl Nussbaum-Beach advocates focusing on impact, not just ranking. To me, impact and ranking tend to blur since I think about large-scale, comprehensive reform of schools, not just localized change. Most of us are change agents – whether our agenda is K-12 technology, home schooling, back-to-basics education, or whatever – but it’s hard to make change when no one is listening. If I want to influence the educational technology arena, I need to catch the attention of folks like Will and David and Sheryl and Terry and Vicki and also be able to point educators to them. If I want to influence the homeschooling arena, I need to catch the eye of SpunkyHomeSchool. And so, again, I believe that impact and ranking are somewhat intertwined. Each of us has our own reason(s) for blogging, and of course we always must respect those. I would never presume to either guess others’ reasons or judge the legitimacy of those motivations. Maybe it’s the academic in me, but I think there is worth in someone doing a systematic study of the education blogosphere. It doesn’t have to be me, but someone ought to be able to cite some basic statistics about what’s going on. For example, those of us who advocate educational blogging gain legitimacy from the fact that we know that there are 50,000+ education blogs rather than just a few hundred. In other words, we have the numbers to show that educational blogging is not a fad; whatever form it takes down the road, it’s here to stay. I also don’t know how else to identify the hubs and superhubs other than to do what we did. Although we may have missed some blogs with smaller audiences, I’m fairly confident that we got all the big ones (maybe not in the right ranking order). I personally feel that there is no better way to recognize and honor voice than to share new and powerful voices with others. When I see interesting, illuminating writing, I want to share that with others and to do my part to help those writers gain large audiences. Sheryl said “What is important is giving our students and teachers ‘voice.’ We need to focus on helping them develop as communicators and writers, not rankers, so they have a place at the policy table and can help to leave this world better than we found it.” I concur, but I disagree that ranking is unimportant. If we want students and educators to ‘have a place at the policy table,’ the inherent nature of a complex, self-organizing network almost demands that those folks become a hub or superhub in order to gain the attention of policymakers. Policymakers rarely, if ever, listen to folks who represent small constituencies, so the larger the audience we can give powerful bloggers, the better. 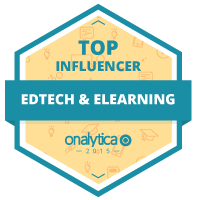 I could have listed just the top few dozen edubloggers in my results, but I didn’t. Instead, I included every single URL that we found so that others could find new voices and bring them to the attention of the hubs and superhubs. I will continue to do this and encourage others to do the same. Indeed, illustrating that perhaps I was deeper in the ‘echo chamber than I suspected, I found some new hubs and superhubs that I didn’t even know existed (for example, how many ed tech bloggers knew about The Panda’s Thumb or Classical School Blog or that they were reaching large audiences?). Terry is right: Technorati has many issues. But until someone points me to something better, that’s the best I have. I, too, am somewhat confused by the different rankings that occur when different URLs are used for the same blog, but I don’t know what to do other than to provide an online form that people can use to fix or include their URL for next time. 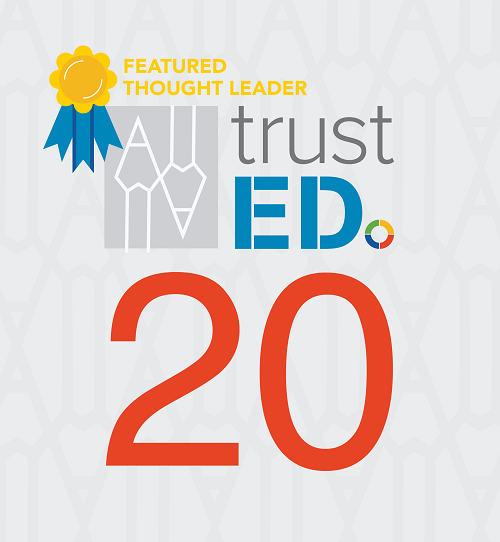 We started with CASTLE’s participant lists from LeaderTalk and our Principal Blogging Project, January’s education blogosphere survey, and the messages I received from my aforementioned January post on top edublogs. This garnered us a few hundred blogs. Then Jenni and Eric combed scores of education blogs’ blogrolls. We found over one thousand blogs this way. They dug through blogger lists like the ones at Support Blogging, BlogBridge, and ScotEduBlogs and got hundreds more. With the gracious assistance of all three organizations, Jenni and Eric scraped blog URLs from November Learning Communities, Edublogs, and Class Blogmeister and found hundreds more. In the area that Edublogs uses to communicate with its users, James Farmer posted a link to an online form for us and we got another 224 that way. 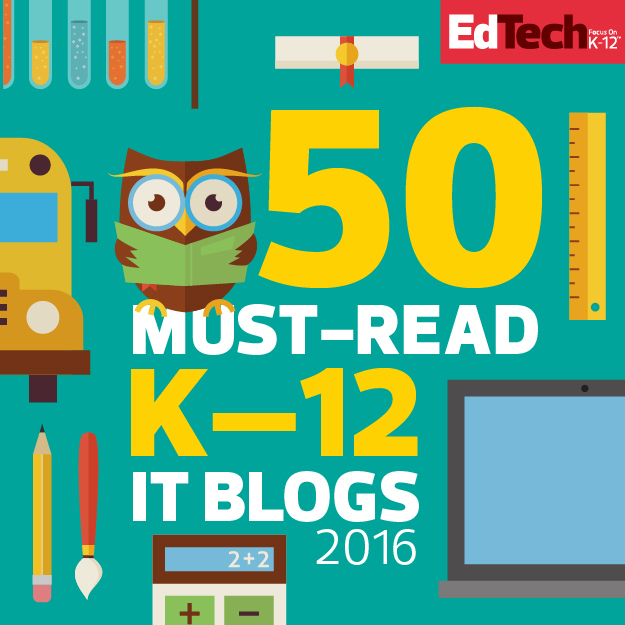 And so on… In other words, we tried to find every list, edublog hosting service, blogroll, etc. that might have new blogs that we hadn’t found yet. Then we had the joy of finding and eliminating duplicates. Ugh. 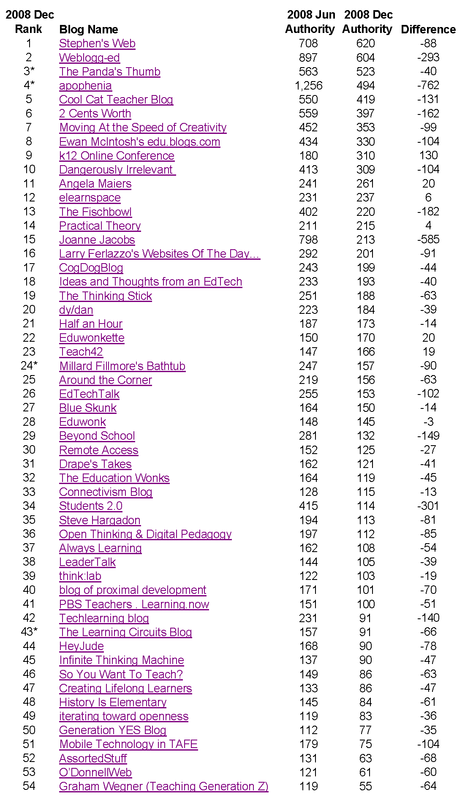 Technorati lists 14,854 blogs with a tag of ‘education.’ It lists 23,807 blogs with a tag of ‘school.’ James informed me that Edublogs alone is hosting over 50,000 educator blogs, most of which are private and classroom-oriented. As you’ll see, we didn’t get anywhere near that many URLs. How many edublogs are there? Over 50,000. How many are in this analysis? Over 3,600. Step 2: Rank the blogs we found. This was easier. Jenni and Eric copied each blog URL into the search box at Technorati.com and then entered into our spreadsheet the blog’s Authority (i.e., how many blogs have linked to it over the last 6 months) and Rank (i.e., overall rank among the tens of millions of blogs that Technorati monitors; lower is better). For example, at the time we checked, Patrick Higgins’ blog, Chalkdust, had an authority of 40 and a rank of 153,160. 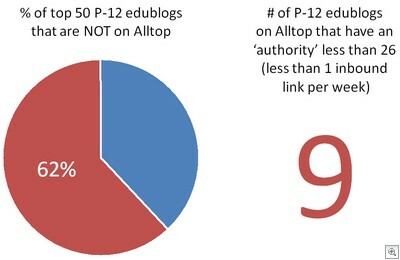 Many blogs had an authority of 0 or had nothing listed at all for either factor. Step 3: Sort and present the results. 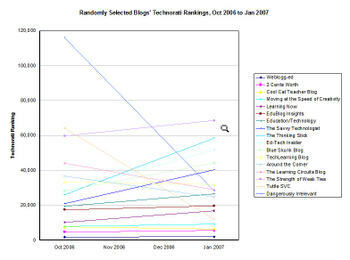 As you can see, Inside Higher Ed is the most popular edublog on our list according to Technorati’s Rank feature. 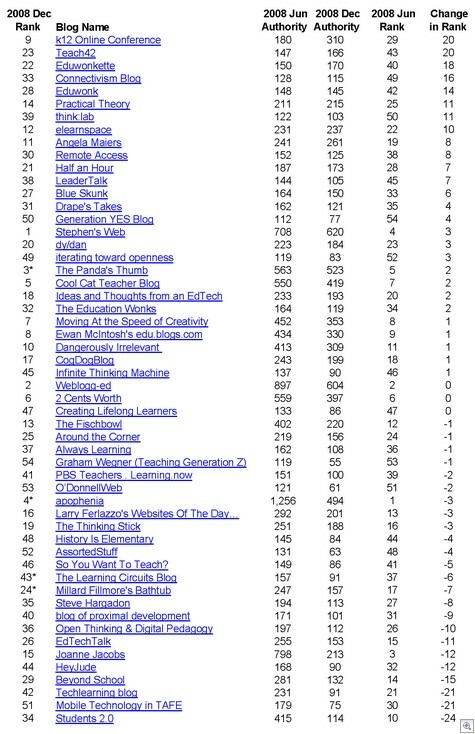 Rounding out the top 30 is Infinite Thinking Machine. 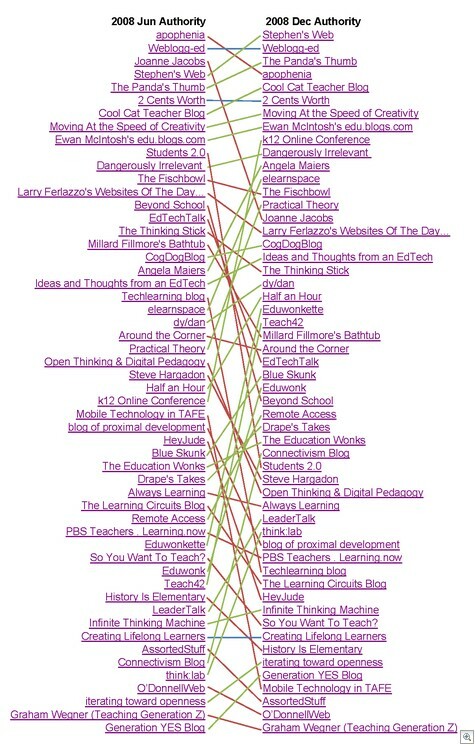 If you look at the Authority of the top 204 edublogs, you’ll see the classic long tail distribution. The top blog, Inside Higher Ed, had nearly 2,400 other blogs link to it over the past six months. 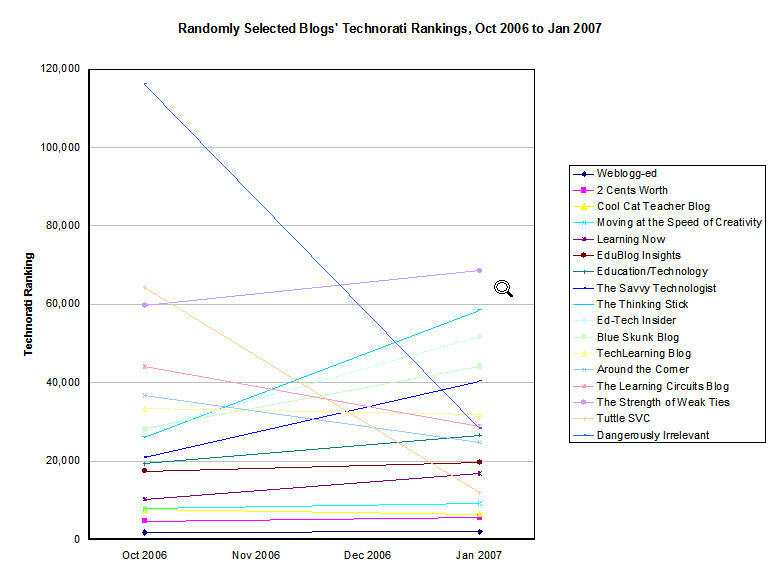 In contrast, the blogs near the end of this graph only had 45 blogs link to them. About two-thirds (2,542) of the blogs on our list had 0 blogs link to them in the last half year. Only 264 averaged more than 5 external links per month. Exactly what constitutes an ‘education blog’ is a matter of interpretation. Jenni and Eric looked for blogs by teachers, principals, superintendents, school librarians / media specialists, technology coordinators, education professors, education critics / commentators, and the like. They had to make some tough choices but tried to include anyone that blogged regularly and often about education. If you think they included a blog that shouldn’t be on the list, get in touch. As hard as we tried, I’m sure we still missed a bunch of folks. If you’d like to be included in our next analysis (hopefully January 31, 2008), please complete the online form. 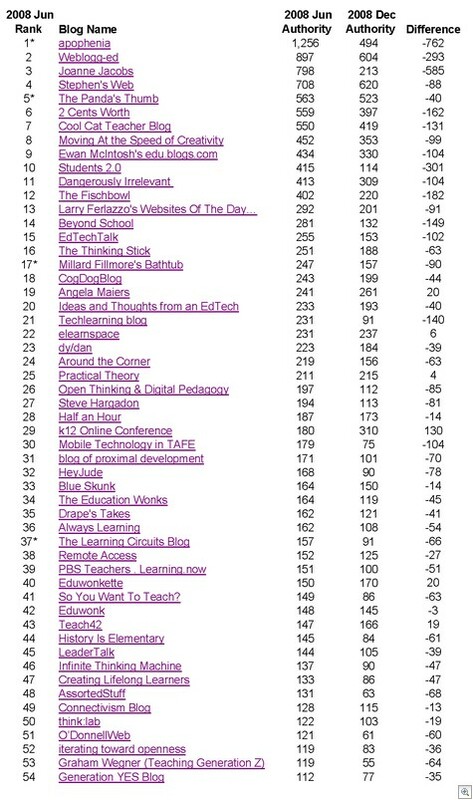 There are many reasons why educators blog and Technorati numbers are just two of many metrics of success. If you’re happy blogging, by all means keep it up! If you’d like more traffic, this list of tips is a good place to start. Technorati numbers were compiled over a 2–week period in late July. All blog rankings and authority numbers are approximate and already out of date. If you want to play with the data yourself, download the Excel file. Please link back to this post or send me your findings so I can see what you come up with! I’d like to do this twice a year, so the next time should be in January 2008. As the list grows bigger, it gets more unwieldy and time-consuming. If you’d like to lend a hand, get in touch. If you have any suggestions for how to expand this analysis or do it differently, please leave a comment below. I’d love to hear your thoughts. 8/1 Correction: The data for Education Week, The Fischbowl, and eSchoolNews were erroneously omitted. The two graphs above, as well as the downloadable Excel file, have been updated to reflect the data for these two sites. Miguel’s wistful. Anne’s feeling dull. Wesley’s introspective. Doug’s worried that some of his favorite bloggers are trying to compensate. to get stuff out of our heads! and so on… We have multiple, overlapping, sometimes conflicting reasons for blogging. And thus the diversity of the blogosphere reflects the diversity of our humanity. We’re all trying to make sense of this stuff. It’s not always easy. Can you find knowledge in unlikely places, just like a beginner would, and then give that knowledge away? 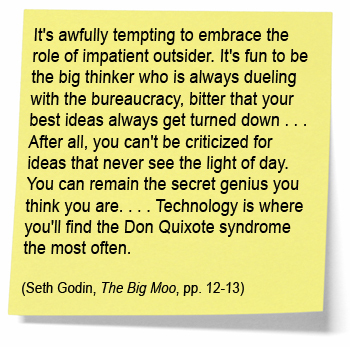 Can you put aside the list of edubloggers that everyone links to, and find new voices? Help me make my list as long as possible? Let’s all explore some new voices while simultaneously hanging out with old friends. I know I’ve missed some people. Now that my disclaimers are out of the way, here’s what I’ve got: Will Richardson is more popular than eSchoolNews. Stephen Downes, David Warlick, and Vicki Davis are more popular than Education Week. Wesley Fryer is more popular than the feed from the main TechLEARNING web site. How do I know? Here is my Excel file. Feel free to play around with the data as desired. Below is a chart of what I think are the top 30 edublogs as measured by Technorati rankings (click on the chart to see a full-size version). I’ve defined an edublog as any web site or blog having to do with education that has a RSS feed. 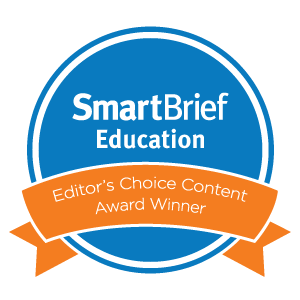 Web sites like eSchoolNews and TechLEARNING thus are included. If you don’t agree with my definition, exclude whom you want and go a little farther down the list in the Excel file. Did I forget someone? Highly likely. Let me know and I’ll add them for next quarter (April 2007). I only joined the blogosphere last August and still am learning my way around. Plus, in case you haven’t noticed, the blogosphere is a big place and it doesn’t come with an index. 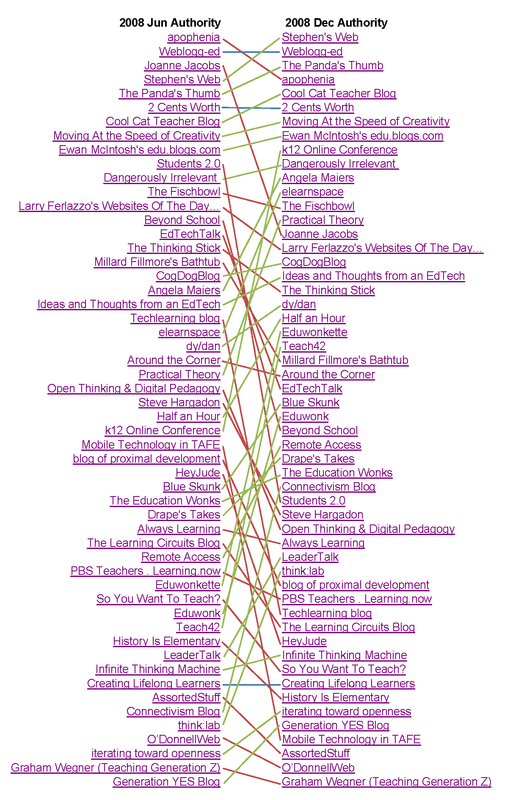 With your help I can keep adding to and expanding this list and start tracking the educational blogosphere a little better. For example, there are a bunch of blogs from the education blogosphere survey that aren’t in the Excel file. I simply ran out of time and will apologize now for anyone on that list that isn’t included. I’ll make sure you’re in the April report. I’m a professor at a big research university, but this is not a research study. I’m just playing around with some data because that’s what I like to do (yes, I’m a data geek). Concerns aside, there is some interesting info here. Over time this will get better and more complete, particularly with your help. Please don’t get offended if you got left out: e-mail me your Technorati URL and I’ll add you for April. I figure that by the end of the year this should be humming along pretty well. I welcome all suggestions and feedback; I’m trying to be as open and transparent as possible. Happy data exploring. P.S. 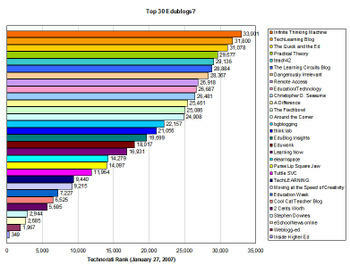 I unapologetically admit that I care about my Technorati ranking. Why? Because I’m trying to make change. The bigger audience I have, the more readers I reach directly and the more people I can influence indirectly through those readers. I’m on a mission. Aren’t you? I made a short Flash video describing the general findings (or you can download the PowerPoint file without my voice narration). I made a privacy-protected Excel file that you can download to do your own analysis. If you just want to read participants’ responses but don’t want to do any analysis, this subset of the Excel file is formatted for easy reading and printing. Just click on the different worksheet tabs at the bottom. While the survey was a nonscientific, general request for all interested edubloggers to participate, there are some good (and interesting) data in there. Results represent 160 education bloggers. I have no idea how many education bloggers there are total, so it’s hard to know what proportion of the whole these 160 represent. As I discuss in the video, it was neat to see fairly strong confirmation that, for most folks, blogs are not, in the words of one respondent, “narcissistic ventures” of self-publication but rather a powerful mechanism for communication, personal learning, and community-building. Blogging to build personal learning networks is as good a meme as any for folks who are unfamiliar with blogs. Thanks to everyone who participated in and/or publicized this survey. I’d like to do this again next January with mostly different questions. If you have any questions or comments about the survey results, or have ideas or suggestions for next year, please contact me directly or leave them here as a comment. This post is also available at the TechLearning blog. I’m enjoying blogging. It allows me to connect with others, get ideas out that are bouncing around inside my head, and get some positive affirmation that the ideas that I hold are held by others too. Although I’m making progress, I obviously have a long way to go before I catch up to some of my blogging colleagues! All of this online buzz and hoopla by and between us bloggers is wonderful. I learn a ton from my blogging colleagues and I have seen the way I think about some topics shift dramatically as I read and interact with others. I wonder, though, how much difference we’re actually making with our intended audience of K-12 educators. 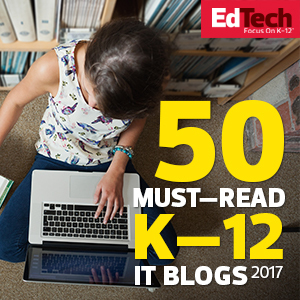 Are most teachers and administrators reading even the most popular ed tech bloggers such as Will, David, Vicki, and Wesley? Probably not. Although Technorati only shows links from blogs, not the number of page views, I’m guessing that collectively we ed tech bloggers still are reaching only a tiny fraction of teachers and administrators. If there are 90,000 public schools in this country, that’s a lot of educators. I think it’s important that we bloggers remember to go beyond providing thought leadership, witty critiques, and insightful commentary and actually provide something tangible now and then that our readers can take back to their school organizations. Whether it’s something small like my Why Blog as an Administrator? packet or something bigger like School Data Tutorials or Class Blogmeister, the more we give our readers concrete resources that they can use with other staff, the more we further our cause of effectuating change. I don’t think that merely posting about various topics is enough. We don’t have to create new tools, necessarily, although of course those are always needed. I think my Why Blog as an Administrator? packet and my list of Digital kids. Analog Schools. 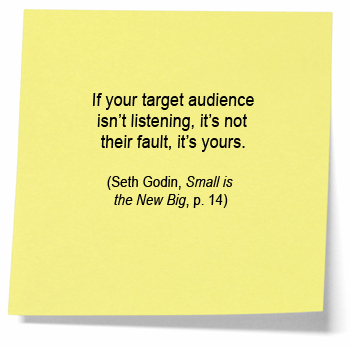 quotes show that repackaged blog content can have a lot of value to others. I encourage anyone and everyone who’s reading this blog to think about how your own content, whether it’s short pieces that you’ve written or blog posts or whatever, can be packaged and disseminated to effectively reach teachers and/or administrators. Because we’re primarily working through our readers (unless we present at a workshop or conference), when we do this we need to be cognizant that our material should be packaged so that it can be used by others. If we do this right, we become secondary change agents, working through those educators who like our stuff and want to use it to make a difference in their organizations. Between us there is a lot of good stuff out there – we need to somehow make it more available and more public. We can’t be worried about bragging. If we have something worth sharing, we need to get it out there in formats that educators can use. I don’t share my data-driven decision-making white papers and my administrator blogging packet because I think they’re the best thing since sliced bread. I share them because they’re a resource that some educators have found valuable. Since this is the case, the more broadly they’re disseminated and publicized, the more likely that others will find them, and find them valuable, too. Let’s work on ways to get our content and tools and commentary into the hands of the educators who really need them, the folks who still aren’t sold on the value of technology. Let’s also try and remember to highlight specific examples of changes that we’re enabling. If something successful happens because of our work, either directly or indirectly, let’s be sure to make those examples as public as possible. Most of us can probably identify several examples of successful change that we have facilitated but that few folks know about. Get the word out. Again, it’s not about bragging but about providing concrete examples that others can tap into. Few of us want to be modern-day Cassandras, railing at the ignorance and intransigence of educators and policymakers. I think that most of us feel that we have something worth saying, and information and resources worth sharing. One of our critical tasks is to extend our reach beyond our small community of bloggers and blog readers and find ways to reach the rest of the K-12 world. We can only reach so many people through our blogs, workshops, and conferences. We need to tap into the larger pool of educational technology advocates and feed them resources they can use to move things forward.